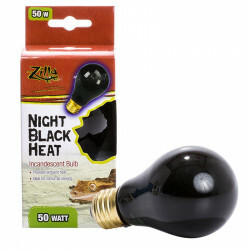 Zoo Med ReptiCare Ceramic Infrared Heat Emitters provide 24 hour heat for all tropical and desert reptiles. 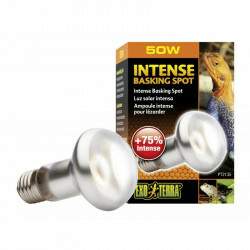 Each ceramic heat bulb lasts up to 5 years, which is twice as long as the competition! ReptiCare Heat Emitters emit no light, are water resistant, and perfect for high humidity terrariums. These porcelain heating devices screw into a standard porcelain incandescent socket, giving off intense, "muscle-penetrating" infrared heat, while emitting no light. The flat-faced design is more efficient and longer lasting than conical designs which build up excess heat internally, ultimately carbonizing the element. 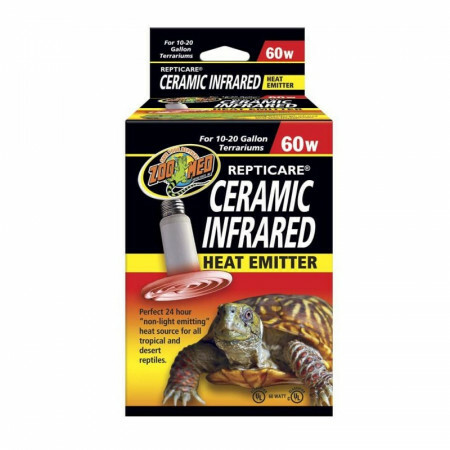 Zoo Med recommends using the ReptiCare Ceramic Infrared Heat Lamp with the Zoo Med Wire Cage Lamp (LF-10), as well as a thermostat or rheostat to control the heat output. This heater has no Teflon coating. UL/cUL classified when used in conjunction with Zoo Med's Wire Cage Clamp Lamp (LF-10). The Zoo Med ReptiCare Ceramic Infrared Heat Emitter proved to be too hot for my 55 gallon Exo-Terra terrarium.I have a near adult beardie and he moved away from the heater. Of course, it is summer here in the high desert which may be part of the problem. I am keeping it to try in the winter when it is much colder both out side and in side the house. Other wise, it worked perfectly well. Great product, packed very well, fast shipping. I am very pleased. As winter is here, sometimes during the night it's a little difficult to get Trip's tank up to the right temperature, even if we have the heat on in the apartment. Sometimes I'll hook up the ceramic heater (it's far too small to heat his 55 gallon tank by itself) along with his night lamp, and it will keep things nice and toasty for him without giving off any light. That way I can sleep in peace knowing he's comfy. Arrived in great condition. Works well. I love the Ceramic Infrared Heat Emitter! It gets the temperature very warm and very fast! Also, you don't have to go through the hassle of changing day lights to night lights as the Ceramic Infrared Heat Emitter doesn't produce light! My Ball Python loves this product! I bought this for my red leg tortoise to keep her warm at night. Works well and is nicer than a infrared heat emitter since it produces no light. She sleeps under it at night. After you've had this light on for a while, turn it off and DO NOT TOUCH it or the fixture for like an hour. This thing is seriously hot. I try to keep my Bearded Dragon hot side at around 110-115 degrees F, even 2 100w heat lights don't do the trick alone. But with this product I seem to be temping correctly. Perfect shipping, perfect price, perfect Ceramic Infrared Heat Emitter. 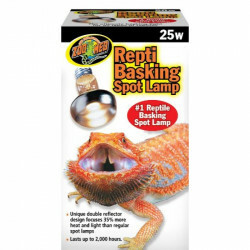 I purchased this item for our family's Bearded Dragon. I got the 100 watt for a 50 gallon tank. The weather here in Colorado can get cold at night. I can sleep well knowing he will be comfy, cozy and at a perfect temperature to keep him healthy and warm thru the cold nights. This does not take up a lot of room either. I turn off his solar and turn on his new heater and he is fine. 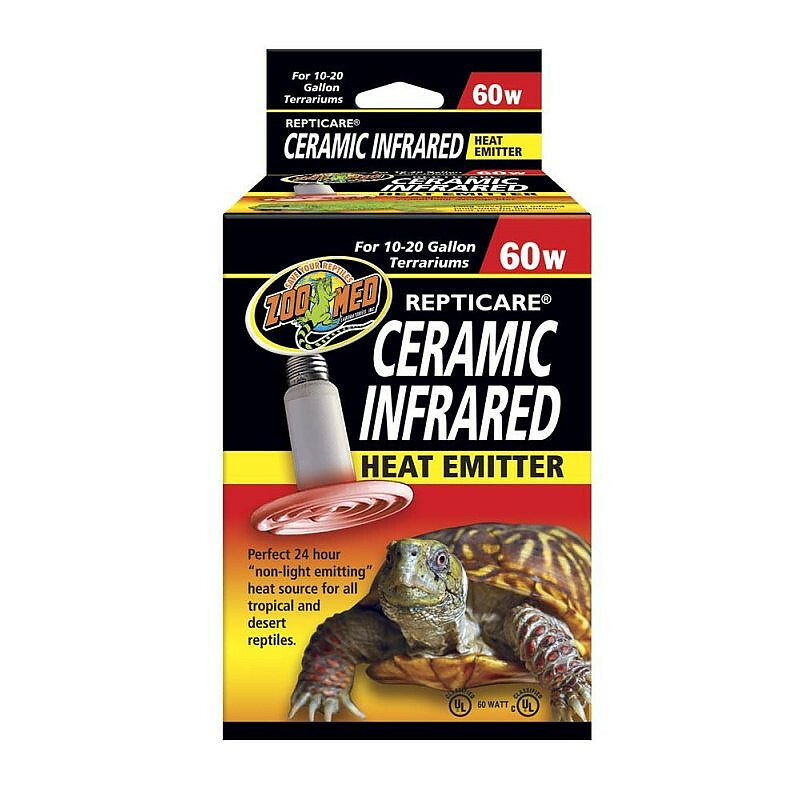 Ceramic Infrared Heat Emitter by Zoo Med are the best! Item puts out a lot of heat and no light! What more could you want? i bought the 60 watt one thinking it'd be pretty strong but i was wrong. i use it for my aquatic turtles. the light is pretty high up above the dock and the heat doesn't reach my dock. i guess i'll just add another bulb. 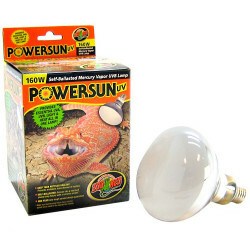 Great for the winter works great no light at all and plenty of heat all i can say is if you have a big tank go with the high watts if you have a small tank go with the 60 watt. All around a great bulb little pricey but it's got the zoo med name so it's got to be good and should last. PetMountain is awesome. I found everything i needed for HALF the price from everywhere else and am very happy with the quality. I will be ordering all of my animal supplies from here. Thanks! This lamp saves my turtles during the winter, they even sleep under it at night. Frist one I got works great the second one a 60 watt DOA plug it in same light and wouldn't work pull bulb out put back in it arc put hole though side of light bulb socket and to replace this 17 dollar item ill have more out in shipping then bulb. These heaters work great, we use ours for our Beardie at night as not to disturb his sleep. No light is emitted. Petmountain had the best price around even with the 2.99 shipping!! Ive always wanted to try a ceramic heat emitter. Works great heats up really nice. I can really tell my bearded dragon likes it better than a standard heat light. I thought it would get a little warmer over all but it still does the job , just a little closer. We used the 150 watt for our bearded dragon. Kept him nice and toasty. Just be very careful with handling it. Very delicate. I was nervous about this heat lamp since I hadn't seen one up close - but I really needed a dark heat option. The tank is in my daughters room and she was having to sleep with the red light which wasn't working. This lamp heats my 40 gallon tank just fine and leaves the far side of the tank a little cooler so our Bearded can have some options. Two plugs are controlled by one rheostat. I have used for over one year and have been able to control the heat easily. The control is working as good as new after one year.